I have a shampoo/conditioner review for you today! Some of the biggest issues I have with my hair are oily roots, dry ends, and the humid climate I live in. I would say for all intents and purposes I have straight hair. It's not bone straight, but it doesn't have any definable waves or curls. The humidity does weird things to my hair. I don't know if frizzy is the appropriate world since my hair is not curly or wavy, but the ends of hair tend to get fluffy or flip up at the bottom. Whatever it is, it's not cute. 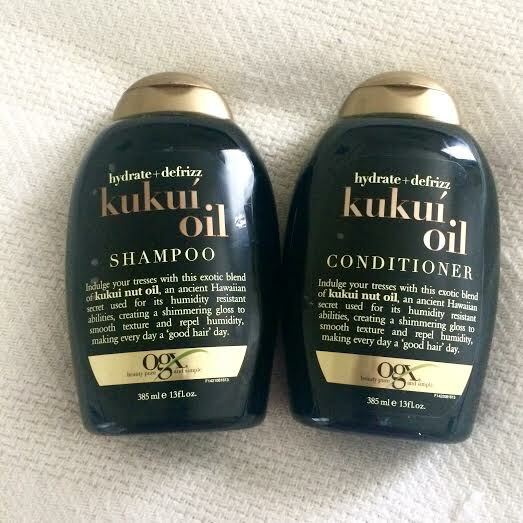 I had been using the OGX Kukui Oil Anti-Frizz Hydrating Oil the past few months with some good results, that I decided I'd take a chance on the shampoo/condionter. The Kukui Oil formula is really made for people with dry, frizzy, and curly hair. My hair doesn't really fit any of that criteria, but I find despite having oily roots that hydrating hair products work better for me than stuff geared for oily hair that strip and dry out my hair. I bought this shampoo and conditioner without looking up reviews which is not something I do often these days. When I got home, I looked up reviews and saw these were reviewed very poorly. People either loved it or really hated it. People mostly hated though claiming it either did nothing or dried their hair out. I almost returned them without trying them, but I decided to give them a shot. The results? I LOVE this shampoo/conditioner. Product Description: Sulfate free. OGX's Kukui Oil indulges your tresses with this exotic blend of kukui nut oil, an ancient Hawaiian secret used for its humidity resistant abilities, creating a shimmering gloss to smooth and repel humidity, to help make every day a "good hair" day. Time Used: I've been using these products for a month now. Scent: This has a warm coconut tropical scent. Consistency: The consistency of this shampoo is very thick and I almost want to say chunky. I know that sounds unappealing, but it's not. You can actually see the little kukui oil bits in the shampoo which is reassuring that you're actually getting the product described. It does come out of the bottle easily though it's just thicker than normal shampoo. The conditioner is smooth and thick and similar to the texture of most conditioners. Application: This lathered really nicely for a shampoo with out sulfates. I did not find I needed a lot of this shampoo at all to cover all of my hair. Price: You can purchase this at drugstore and big box stores in the $5.50-$8.00. Results: The midshaft of my hair to my ends is usually dry after any shampoo. I have to say the Kukui Oil shampoo and conditioner eliminated that entirely. My hair feels fully moisturized from root to tip. It's silky, shiny, and so manageable. This shampoo/conditioner combo most definitely repels humidity for me. I find after a day outside my hair hasn't done funky things at the ends and keeps its shape. I have oily roots, and I don't find this exacerbates the issue either. My hair feels completely balanced with these products. I'm a happy camper. It goes to show you how varied the experience is with beauty products. I was not even going to give these a chance based on the reviews I read, but this turned out to be a star product for me. I can't say the same for other people. I think there are substantially more factors at play with hair care products rather than nail polish. I wouldn't let negative reviews dissuade you from trying a product that interests you. You may have a different result!